So today I wrote words. More than 1667 words, which is important. It’s my first full Nanowrimo. I’ve done several Camp Nanos. This is different. People meet up to write together and try not to distract each other. I find that both mystifying and comforting. Here are things I looked at today for Chapter Two of Heartfire. This woodpecker can turn its head all the way around kind of like snake. It’s totally creepy. 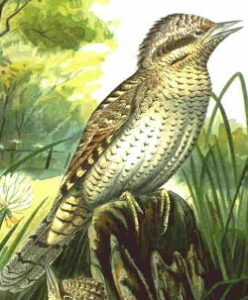 It’s called a Wryneck. 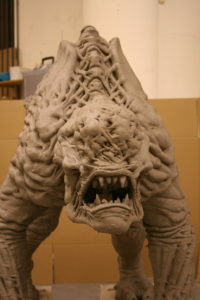 This is a sculpture of a creature in a tv show, Merlin. 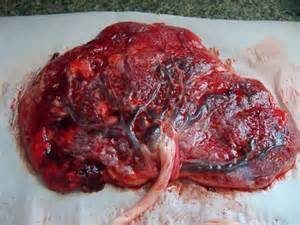 And this is a placenta. How is that for a novel aesthetic? Novel aesthetics are basically visuals that authors create to inspire them and communicate the mood of their book. Basically, a moodboard. I just think aesthetic shouldn’t be a noun. but then I’m a pedant. And if you can’t beat them, gross them out with your way too truthful blog posts. Anyhow I did 1,723 words today and I did it before midnight in California. So there. Sara stared at her to-do list with feral hatred. She wanted nothing more than to see it disappear. The damned thing kept growing. Her blue eyes blazed, regarding it. She drummed her fingers on her industrial-style desk in her tiny but stylish intern office. Sara suspected it might have once been a closet. The exposed brick walls and high ceilings made the finger-tapping echo. The sound grounded her, its rhythm helping her to focus. The first item on her list remained the mammoth and no number of dirty looks would make it disappear. She started sketching just as a knock sounded at her door. Bastien Crowe entered, a big smile crossing his handsome face. Too-long shaggy blonde hair flopped into his eyes, which were framed by sleek modern glasses. He looks more like a surfer than a famous sculptor when he takes those glasses off. I wonder if he really needs them. Bastien stepped into the office and closed the door behind him, leaning against it. He looked up at the ceiling and pursed his lips, then locked eyes with her. With a kilowatt smile, he was gone. Bastien normally lived in California with his family, closer to Hollywood. He was here for the next six months working on an autobiographical piece, and had decided to offer an internship to one lucky student from the Hite Institute at the University of Louisville, in collaboration with Actor’s Theatre. Actor’s had provided space for Bastien’s Wryneck Workshop to work while he was based here. As a creature and special effects shop, they were very well known and only growing in fame, for those who followed such things. But this next project would make them legendary, the equivalent of ILM. And Sara was working on it, part of the team. But only if I get these sketches done. She turned to her pink emac and popped open Safari, typing in the search. Afanc. The images she found weren’t terrifying. Most of them were awkward mash-ups of a beaver and crocodile. The rest ranged from werewolf to dragon. These were either hopelessly overdone or not credible. No help there. Closing her eyes, Sara reached for the Song. She couldn’t hear it, not the way she did in her dreams. But she knew it was there. So she waited, holding herself in solitude and silence. She listened. She had a large heartfire, she could do this. Sara breathed, in and out and focused on her breathing. She waited. The answer would come. Slowly, an image formed in her mind. Sara turned back to her sketchbook and began drawing. The creature had to be able to stand on two legs. At first she thought of him as short, because of all of the references to dwarves. The proportions just didn’t work, and she went the other way. She made him twelve feet tall. Nodding to herself she began to add in detail. The first thing she added was a wide gaping maw with broken teeth. Those teeth had eaten warriors and children alike. Their jagged edges needed to reflect their history. The mouth was enormous, out of scale with the head. Massive jaws that could rend gaped, filling the scene. Above the mouth she wrapped sinew, exposing tough but ropy and veined tissue. It covered the creature, hanging from bones as if half-rotted. The writhing shapes evoked worms, put her in mind of maggots. She added claws and made the creature eyeless. Sinew snaked across the sockets where his eyes should be, latticing. She sat back and just looked at him. She took the sketch and tacked it to the corkboard that lined one wall, then stepped back. Quickly she dashed off a few alternate views of the massive creature, a half dozen supporting views. Line drawings really, but she didn’t have time for much else. It was almost time. The main sketch would have to get the idea across. She slipped the sketches into her light portfolio and headed for the conference room early. She had to get these approved before the meeting. Bastien nodded to her as she entered the large space and jerked his head toward the display area. Sara strode to the cork strip and hung her first sketch. She would hang them in sequence from most detailed to least. She tried not to stare at Bastien as he followed her, silent. He stood before the image, his eyes hooded, for a long while. She glanced at him, nervous, then turned to hang the next sketch. “This is skin?” He pointed to the ropy tendons. “A placenta?” Bastien’s eyebrows shot above the rim of his glasses. “Really?” Her voice squeaked, but she didn’t care. The team surged forward with a murmur of agreement and delight. Sara relaxed for the first time since she had taken the position, feeling all fear and anxiety lift, leaving her giddy with relief and euphoria. She had done it. She had conquered the afanc. She could do this. She wasn’t just a glorified office girl, she was going to really contribute to the Workshop, to a real film. Bastien laughed at her astonishment. “Sure. This area looks like Europe. It’s why the US put Fort Knox here, so they could train the tank division in terrain similar to that in the EU, back in the day. There are more lakes here than anywhere else in the US, it’s inexpensive. And there are caverns throughout the state that make it uniquely attractive. I can’t promise but it’s looking good. The scout will be here with the studio exec.